2. For the Topping: Melt the butter in a well seasoned Lodge 9 cast-iron skillet over medium-high heat. Add the brown sugar and melt, stirring constantly, until bubbling, about 6 minutes. 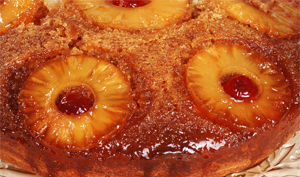 Remove from heat, add pineapple rings in one even layer, and set aside. 3. For the Batter: Beat the butter in a large bowl with an electric mixer until light and fluffy. Add the sugar and beat until creamy. Add the eggs, one at a time, beating well after each addition. 4. Beat in vanilla and coconut rum. In a separate bowl, combine the flour, cardamom, baking powder, and salt. Add half of the flour mixture to the egg mixture and beat on low speed just until blended. Add the pineapple juice and beat on low to incorporate, add remaining flour mixture,beating until just incorporated. 5. Spoon the batter over the pineapple, smoothing the top evenly. Bake on the center rack of the oven until golden brown and a skewer inserted in the middle comes out clean, 45 minutes to 1 hour. Remove from the oven and let stand for 5 minutes. To remove from the skillet, run a sharp knife around the edge to release the sides. Invert a cake plate or service platter over the skillet and invert the cake onto the plate, keeping pan and plate firmly pressed together. The cake should drop from the skillet onto the plate. 6. Drizzle the cake with additional coconut rum, top with toasted coconut flakes, and serve.